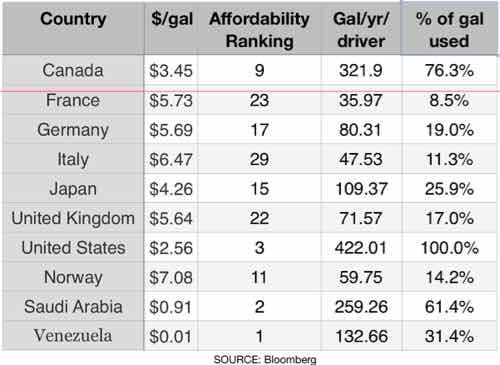 Gasoline here in the U.S.is cheap compared to much of the world. Global gas prices are on the decline—about 2.3 percent, on average, in the past three months. Behind that modest decrease is a wide range of price swings felt differently around the world. We ranked 61 countries by three economic measures to see which has the most affordable gas and which feels the most pain at the pump. Canada is seeking to restore its image as a leader on global warming with a nationwide tax on carbon pollution. The country has a lot to lose: Vast reserves of difficult-to-extract oil will mean either an environmental toll to produce it or an economic toll to keep in the ground. Cheap gasoline in Canada goes hand in hand with high consumption—only Americans use more per person. The French can afford to pay for their expensive gasoline, but they’re increasingly turning to electric cars instead. French automakers Peugeot and Renault are both competing in the expanding market for EVs. France has one of the world’s highest EV sales rates and one of the densest charging networks. German gas isn’t exactly cheap, but it’s little bother for the average driver in Europe’s largest economy. Gas consumption is average and is likely to decrease as the country commits to battery-powered cars. Incentives were introduced for car buyers in 2016, and BMW and Volkswagen are now working to electrify their fleets. Car ownership in the home country of Ferrari and Maserati is among the highest in the world. However, the prolonged slump in global oil prices offered less relief to Italian drivers than in most countries, largely because of the country’s high taxes on fuel. Japan’s long-standing national gasoline tax helped its carmakers take an early lead in developing fuel-efficient vehicles. Toyota and Honda invested big in fuel-cell technology, while the Nissan Leaf became the world’s best-selling electric vehicle. Japan now has more public battery chargers than gas stations. Sales of electric vehicles are accelerating in the U.K.—one of the biggest markets for battery-powered transportation. EVs make a lot of sense in a region defined by short driving distances and one of the highest gasoline prices in the world. President Donald Trump has scrapped environmental regulations and supported fossil-fuel production in the first months of his presidency. But if success is judged by the price of gasoline, there isn’t much room left for improvement. U.S. gasoline prices tumbled under his predecessor, Barack Obama, while oil production soared and cars became more efficient. Americans still guzzle more gas than any other country, so even with low prices, a thirst for the open road takes a bite out of the average paycheck. Norway’s high gas prices and high incomes are an electric car maker’s dream. The country has the biggest share of electric vehicles in the world. That may seem strange for an economy built on oil, but Norway is one producer that doesn’t subsidize gasoline at the pump. Instead, the country uses its oil riches to fund national services, such as free college education and savings for infrastructure improvements. The Saudis sit atop two enormously valuable bodies of liquid: oil and water. Both are being pumped to the surface at unsustainable rates. Saudis rank among the greatest gas guzzlers in the world, but they devote a below-average share of their incomes to buying it. That’s because the government heavily subsidizes the price at the pump. Life, liberty and the pursuit of happiness. Countries have different ideas as to which rights are inalienable, and Venezuela stands alone in considering nearly free gasoline a birthright. In 2016, President Nicolas Maduro raised pump prices 6,000 percent, but filling up a tank of gas still costs less than a cup of coffee. Venezuela isn’t a rich country but consumes gas like one. I complied some of the information into a chart — looking at price per gallon, affordability relative to wages, gallons used per driver, and how each compares to the highest user of gasoline. As you can see four other G7 countries (France, Germany, Italy, UK) have gas prices that are at least twice ours. Twice. We use far more gasoline than everyone else — even the two countries with more affordable gasoline. Still, more than half said our gas prices are on the low side of the scale. 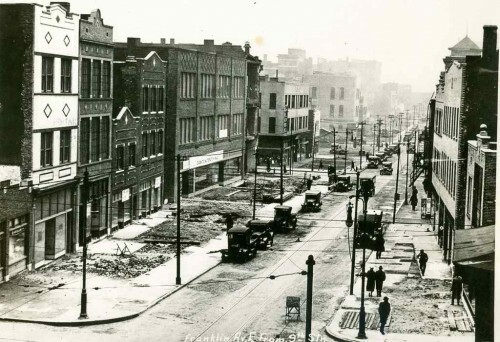 Decades of low taxes enabled us to build a non-sustainable auto-centric built environment. We can’t just raise taxes to where they should be, at least not too quickly. But we can’t continue to neglect our massive amount of crumbling infrastructure. 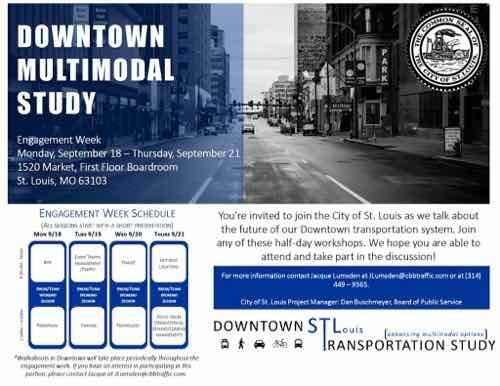 You’re invited to join the City of St. Louis as we talk about the future of our Downtown transportation system. Join any of these half-day workshops. We hope you are able to attend and take part in the discussion! The week includes 8 half-day workshops scheduled around various topics. Please review the engagement week flyer pictured for more information about the schedule breakdown. Each workshop consists of different activities to gain feedback important to the study. For more information contact Jacqueline Ann (Jacque Lumsden) at [email protected] (CBB Transportation Engineers + Planners) or at (314) 449 – 9565. City of St. Louis Project Manager: Dan Buschmeyer, Board of Public Service. 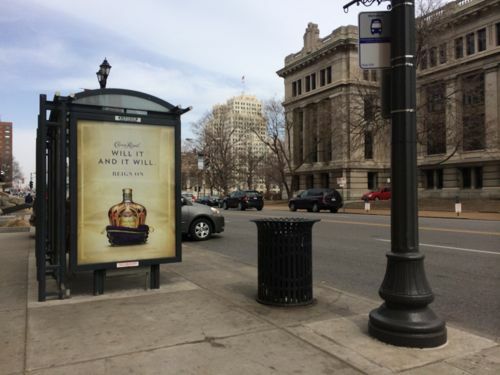 All will take place in the 1st floor boardroom at 1520 Market. Foe more specifics see the Facebook Event page. Last month I wrote about a new book, an excellent design guide, see Reading: Urban Street Stormwater Guide by the National Association of City Transportation Officials. I loved it so much I asked the publisher to send me the rest pf the hardcover guides: Transit Street, Urban Bikeway, and Global Street. All information in the printed guide books is available for free online. 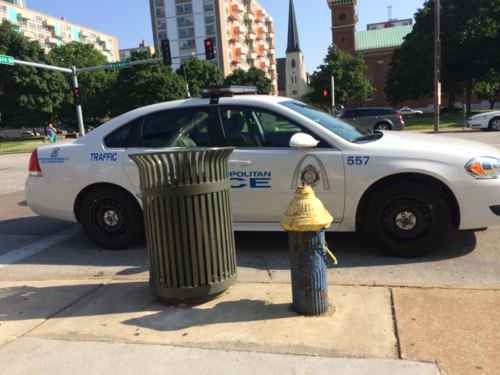 There are some here trying to get the City of St. Louis to become a member city of the National Association of Transportation Officials (NATCO). Who you ask? NACTO’s mission is to build cities as places for people, with safe, sustainable, accessible and equitable transportation choices that support a strong economy and vibrant quality of life. Communicating a bold vision for 21st century urban mobility and building strong leadership capacity among city transportation officials. Empowering a coalition of cities to lead the way on transportation policy at the local, state, and national levels. 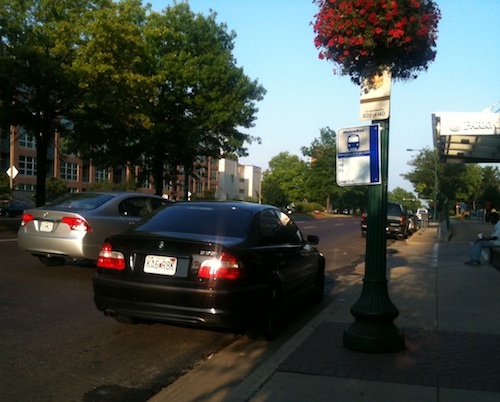 Raising the state of the practice for street design that prioritizes people walking, biking, and taking transit. Since St. Louis, and the region by extension, does the opposite of what NACTO recommends, we could benefit greatly if the city joined — and followed their lead. But I doubt the traffic engineers in the Streets Dept and the like-minded engineers at the Board of Public Service are willing to change the way things have always been done. Again, see various departments fighting NACTO’s recommendations. 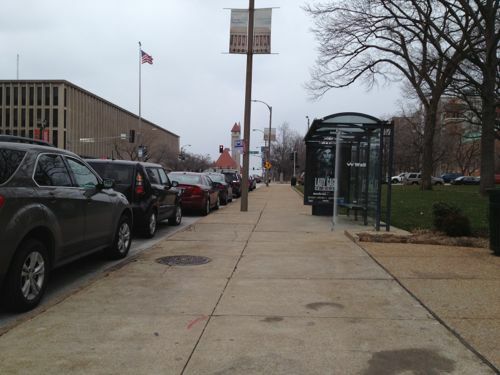 In the coming months I plan posts showing the NACTO way vs the St. Louis way.